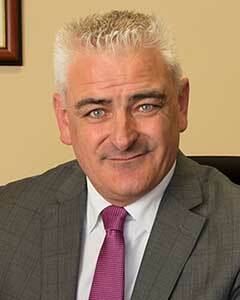 Ronan has vast experience in civil litigation and in particular in personal injury claims. In addition, Ronan is a specialist in conveyancing acting for vendors and purchasers in property transactions as well as working on compulsory purchase orders, boundary rectifications, voluntary transfers, site transfers and mortgages. Ronan is very involved in the local community, business and voluntary organisations. Ronan has a keen interest in athletics and has represented the company in different events most recently 'Ireland's Fittest Company' where the company took home two trophies. In contentious business, a solicitor may not calculate fees or other charges as a percentage or proportion ofany award or settlement.